Are you a visual artist interested in travel, teaching and adventure? 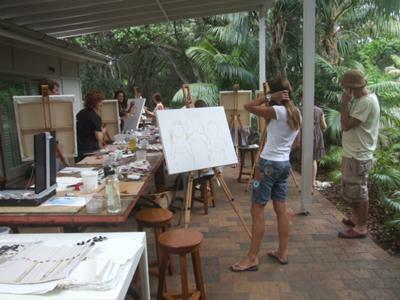 Flying Arts is seeking expressions of interest from experienced Queensland based visual artists and craftspeople interested in teaching in the 2011 Artist on Tour program. Opportunities are available for experienced practitioners and teachers/facilitators in all 2D and 3D art and digital media as well as training facilitators in artist business, marketing and arts project management. Successful applicants will undertake creative and skills development workshops, residencies and/or projects in communities and schools around regional and remote Queensland. You will be flexible and adaptable, be willing to travel and have a great sense of adventure. To register your interest go to the online application form on the Flying Arts website home page. Successful applicants will be notified by November. program and Cairns Regional Council. Ceramic Artists can win $10,000 and Young Artists (18-26 years) can win $5,000 for a work on paper by entering the 2010 Ergon Energy Central Queensland Art Awards at the Rockhampton Art Gallery. Located in the heart of the old town of Vallauris, the association A.I.R. Vallauris (Artists in Residence) welcomes international artists from all horizons to meet and collaborate with local artists and to research and create new work in an artistic laboratory created specifically for them. The quality of the artistic creation is one of the major concerns or the program; the selection committee evaluates applicants based on their artistic experience, merit and project proposal. Since April 2002, over 130 creators of different nationalities have taken part in the program.. The Association encourages and facilitates interaction between local artists and international artists. Workshops, conferences, demonstrations exhibitions are organized with the resident artists. These events are open to the public. Through partnerships with the local School of Fine Arts, the local government, and international organizations a sensibility of exchange between the public, artists, and international is realized. Accountants have a term, goodwill, and it resides on the balance sheet as a kind of intangible value of a company's brand, identity, and the substance it possesses beyond the concrete goods and products. Some managers never bother to think about intangible assets or the meta-physics of their business. But many of us who work in the non-profit and public sectors do, because our main goal is to harness the power of community and leverage the generous in spirit to improve that elusive thing known as quality of life. Sure, we keep our eyes on the bottom line, and monthly cash flows, but we are always thinking about that strange balance sheet item called goodwill. What makes it happen for a city? The answer is pretty simple: meaningful and dynamic experiences provided to residents and visitors do— bold new Ukulele Festival, free circus classes at the Tanks, a colourful parade of thousands along The Esplanade, tango lessons on Tuesday, free film nights against a starry sky, a fantastic waterfront lagoon that somehow remains free of charge for everybody. These all increase the quality of life, while building our city’s own portfolio of impressive intangible assets. In this equation, the primary motive at work is the notion of adding value through goodwill. Why should the business community care? It’s true that festivals, free Zumba, public art in the parks and live music in the streets have little to do with the straight ahead profit motive of the corporate world. For us—call us the goodwill sector—it’s all about community, experiences, and the expression of who we are. But the most successful businesses care about these intangibles as well, and they actively invest in civic affairs and community betterment. Profit remains a motive, but the pursuit of goodwill becomes an equal driver. In so many ways that has been the richest soil for the Cairns Festival, which is now planning its 50th season for this August. A crop of almost 100 events and unique opportunities will fill the Far North, with visual arts, theatre and dance, free music concerts and creative activities for all ages. Our first half-century stands behind us as a testament to those who genuinely care about our sense of place, a council that sees the good in quality of life efforts, and creative people who have never failed to jump in and give our region something remarkable. We call on them now—anyone and everyone with a proposal for a 2011 Cairns Festival event—to share their ideas with an expression of interest. And we call on everyone in the Far North to support the wondrous things inside all the intangibles. The generous sponsors behind our region’s festivals have proved themselves in goodwill year after year. They are extraordinary corporate citizens, visionary leaders and contributors to the cultural advancement of Cairns. At the end of the day, it’s not about who amassed the most cash, who cornered the market for widgets, or who brought the most tourists to spend money on Reef or rainforest. Those things are one level of the formula that equals a vibrant community. But on a larger level, it’s about what we all do together, in this rare and special place, to improve the world around us. It’s about quality of life and quality of living. It's competitive advantage, made possible by human advantage. That, in my view, is the power of the goodwill on our books. The art of the tropical north is sensational. I have been to the CAIF and it was exceptional. 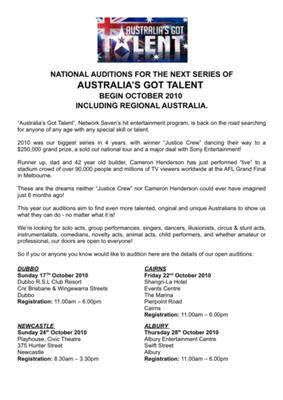 “Australia’s Got Talent”, Network Seven’s hit entertainment program, is back on the road searching for anyone of any age with any special skill or talent. 2010 was our biggest series in 4 years, with winner “Justice Crew” dancing their way to a $250,000 grand prize, a sold out national tour and a major deal with Sony Entertainment! Runner up, Dad and 42 year old builder, Cameron Henderson has just performed “live” to a stadium crowd of over 90,000 people and millions of TV viewers worldwide at the AFL Grand Final in Melbourne. These are the dreams neither “Justice Crew” nor Cameron Henderson could ever have imagined just 6 months ago! This year our auditions aim to find even more talented, original and unique Australians to show us what they can do - no matter what it is! We’re looking for solo acts, group performances, singers, dancers, illusionists, circus & stunt acts, instrumentalists, comedians, novelty acts, animal acts, child performers, and whether amateur or professional, our doors are open to everyone! Please read the terms and conditions of entry prior to your audition. You can email us at gottalentATfremantlemedia.com.au for further information. · If you use recorded music in your act please bring a copy of your music. 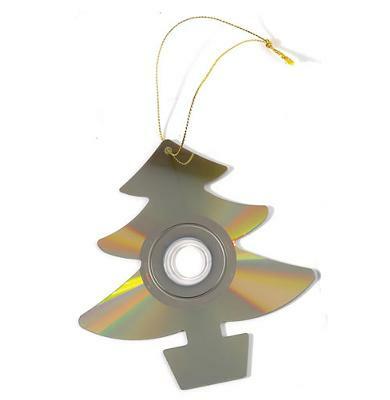 Your music MUST be on CD. · You may have less than 3 minutes to audition so make sure you choose the best part of your act. Please have your music cued and ready to go. · Due to time restrictions, you may be stopped during your audition. · Bring everything you need for your audition such as instruments, props, shoes, costume etc as your audition may be recorded. · If your act has any special requirements involving fire, animals or dangerous stunts etc or if your act is a band, please make us aware of your requirements upon your arrival. · Unfortunately there may be a lot of waiting around, so you may want to bring a book or magazine, water and some light snacks. · Do not post your questionnaire to us. You must bring it with you to your audition. Make sure it is completed before you arrive. Spare copies will be available at the venue. · On arrival at the audition venue you will be given a release form to sign. If you are under 18 years of age you will need to bring a Parent or LEGAL Guardian to sign your release form. You will not be able to audition without a signed release form. · Approximately two (2) minutes in duration. · On a DVD format in Pal with all regions coding. You must provide the names, dates of birth and contact details of all persons featured in your Clip. Your DVD will not be returned. Good luck at your audition. At this free seminar coordinated by Museum & Gallery Services Queensland, art+place personnel will outline the art+place funding program which is designed to breathe new life into public spaces, buildings, parks and facilities across the state. Guest speakers will present an illustrated view of inspirational public art from Australia and overseas and a public artist will provide insights into their practice. A local government representative will speak on the development of a public art policy. After the free workshop, there will be opportunities for booked one-on-one interviews with art+place personnel. Those with a specific project are invited to book an interview slot so they can discuss their project and get feedback on how best to address the funding criteria. This is an opportunity to seek advice on what the assessment panel is looking for in a successful application. If you live outside of Cardwell and need financial assistance (up to $250) to travel to the workshop, please contact M&GSQ on 1800680433 (freecall within Qld) and ask for an art+place travel bursary application form to be sent to you. A catchy name is being sought for the soon-to-be-constructed Mission Beach Community Arts Centre. The $420,000 centre will be the hub for artistic and cultural activities for Mission Beach and surrounding areas when it opens at MARCS Park early next year. It will house an historical display, local and visiting artists' work and offer a broad range of cultural activities and training courses. It is being funded under the Federal Government's Job Stimulus Package and will be built on land leased from Cassowary Coast Regional Council. It is hoped that expressions of interest for construction of the new centre will be called in July. The competition winner and a friend will be invited as a special guest to attend the opening gala event for the new centre. The winner will be announced at the MBCAC 'Build Your Own Website' Training Day at Mission Beach on June 5. For more information, contact Lynda on 0428724410 . I give my permission for MBCAC to use the name .....................................as the new Mission Beach Community Arts Centre name. Would you like to know how to access funds for your arts project? And meet some of the region’s creative people? Tablelands Regional Council is inviting interested people to attend a free Cultural Morning Tea at Tableland Regional Gallery on Sunday 14 November. The event will provide a great opportunity to learn about what the Regional Arts Development Fund (RADF) can assist with, plus offer the chance to see some results from recently completed projects, and to meet some of the region’s creative people. Funds provided by Tablelands Regional Council, in partnership with Arts Queensland, are available to individuals or groups to develop stronger skills and foster many types of arts, culture or heritage projects through the RADF. The morning tea will feature presentations on some recent results of RADF-funded projects. 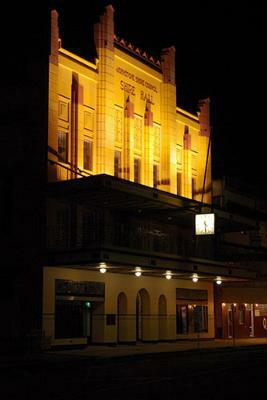 Successful applications have included support for professional development in arts and craft skills; a series of circus arts theatre shows; an artists market; staging skills training workshops; several oral history projects; two cultural tourism projects; an Italian choir and historic silent film project; training a community choir; two disability arts projects; and the development of street theatre aimed at Tablelands challenges. Mayor Tom Gilmore will be presenting certificates of appreciation to outstanding community projects, and presenting funds to new projects for 2010-11. Current RADF Committee Members will also be present from 11am to provide advice to members of the public on how RADF may be able to assist them in funding for their own project ideas. Free training for young artists and arts administrators. Youth Arts Queensland (YAQ) is calling all young creatives from Cairns and surrounds to take part in Navigation, an arts business training course to be held at Kickarts Contemporary Arts from 19-24 April 2010. Navigation is designed for young people wanting to kick-start their careers in the arts and creative industries. The training package consists of seven modules covering project planning, budgeting, working with community, grant writing, marketing, OH&S/risk management, making presentations/pitching ideas and graphic design essentials. All units are nationally accredited and count towards a Certificate III. Daytime and evening classes are on offer and will be lead by YAQ?s lead trainer Ray Bourne, other YAQ staff and industry professionals. If you are 30 years of age and under, you might qualify to participate in the training worth $1,600 for free. Places are limited. To register, fill in the registration form available from the YAQ website www.yaq.org.au/navigation or call (07) 3252 5115 begin_of_the_skype_highlighting (07) 3252 5115 end_of_the_skype_highlighting for more information. Where: Kickarts Contemporary Art, Centre of Contemporary Arts, 96 Abbott St, Cairns. Cost: Free for eligible young people aged 30 years and under. Booking: Places are limited. Please register your interest by submitting a registration form available from the YAQ website www.yaq.org.au/navigation or contact Program Coordinator Luke Briscoe on (07) 3252 5115 or l.briscoeATyaq.org.au. The KickArts Hatch Program has a new name and will now be known as PROFILE. All of the other details including the application forms will stay the same. 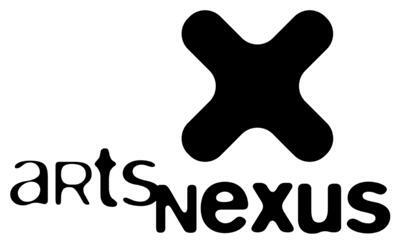 PROFILE is a KickArts Industry Development Initiative to support the presentation and promotion of more artists in the KickArts Contemporary Arts 2011 Exhibition Program. PROFILE is open to all individual artists, collectives and groups from Cardwell in the South to Mount Isa in the West, across Cape York and to the Torres Strait. The program is open to artists of all levels, emerging, mid career and established. It is essentially an opportunity to be able to profile and present more contemporary work and artists from our surrounding region. 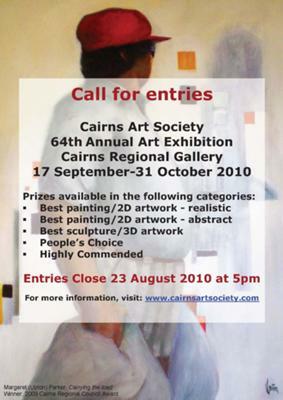 The next big event of the Cairns Art Society calendar is the 64th Annual Open Art Exhibition at the Cairns Regional Gallery, to be held from 17 September to 31 October 2010. The closing date for entries is Monday 23 August. The entry form is now available from the CAS website. If you are entering artworks in the competition, please ensure you read the conditions of entry and sale that form part of the entry form. 6. Art and Office Highly Commended Award: $250 (gift certificate) non-acquisitive. 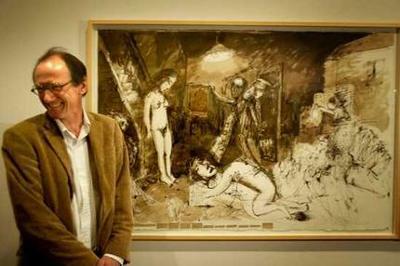 The exhibition judge is Rex Backhaus-Smith, a renowned artist and art tutor from the Sunshine Coast. He has had major exhibitions worldwide, two books already written about him and has acquired an international following. The preselection of entries will take place on 25 August. The final judging takes place at the Cairns Regional Gallery, with the prize winners announced on the exhibition’s opening night on Friday 17 September. For all exhibition inquiries, please contact the Exhibition Co-ordinator, Rose Spencer on 4050 3689 (BH) or email: artists.casATgmail.com. 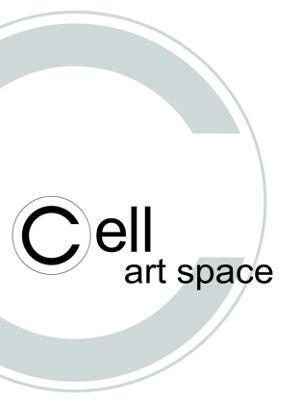 If you’re an emerging artsworker then Cell Art Space wants to hear from you. Cell Art Space (Artist Run Initiative) is an exciting exhibition space in Cairns accessible 24/7 in a unique inner city location. Every week thousands of regional residents, national and international visitors view the space. Cell Art Space has a current team of six volunteer Co-Directors who coordinate our exhibitions and events. Cell Art Space has a growing reputation in Cairns and around the state including securing a recent Arts Queensland grant to fund our nine month From Summer to Spring exhibition program. We’re passionate about supporting independent and emerging artists and artsworkers in Cairns to exhibit their work and gain industry experience and networks. If you’re looking to build a career as an arts manager or curator then Cell Art Space has limited opportunities to join the existing team of Co-Directors. This is an outstanding opportunity to learn from an established team and further your networks in the industry. Please email us at infoATcellartspace.com for more information and an application. It will house an historical display, local and visiting artists’ work and offer a broad range of cultural activities and training courses. It is being funded under the Federal Government’s Job Stimulus Package and will be built on land leased from Cassowary Coast Regional Council. The winner will be announced at the MBCAC “Build Your Own Website’ Training Day at Mission Beach on June 5. I give my permission for MBCAC to use the name ........................................................ as the new Mission Beach Community Arts Centre name. 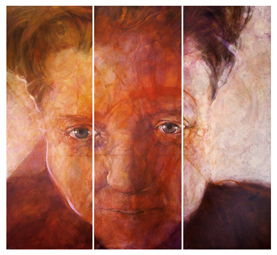 Entries for the $35,000 City of Perth Black Swan Prize for Portraiture are now open! The prestigious City of Perth Black Swan Prize is Australia’s third richest non-digital portrait prize. The annual National prize has quickly become an anticipated event in WA's cultural calendar, creating a showcase of both emerging and established artists. Held in Perth's iconic town hall, the exhibition celebrates Australian’s excelling in their field and strives to foster artistic talent. Visit the website to apply, view previous highlights and join the mailing list. 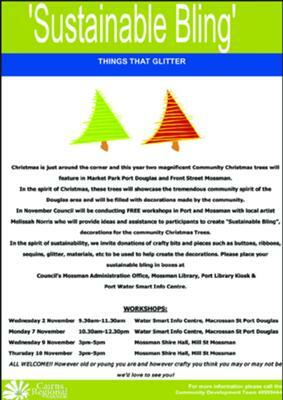 This year as part of Cairns Regional Council's Christmas celebrations there are SIX FREE WORKSHOPS available in different locations to create "Sustainable Bling Ornaments" to decorate Christmas Trees in Mossman and Port Douglas. the Port Library Kiosk, Port Douglas. All are invited to come along during the first few weeks of November to any or all 6 FREE workshops held in Mossman & Port Douglas(see included poster and watch for local newspaper promotions for info). 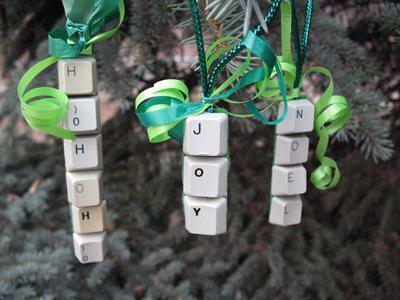 Participate in workshops facilitated by local artist, Melissah Norris, who will provide ideas and assistance to participants to create the "Sustainable Bling Ornaments" that will decorate the Christmas trees. The Community Christmas Trees will be located in Market Park, Port Douglas and the other between Mojos & the Ambulance Station in Mossman. 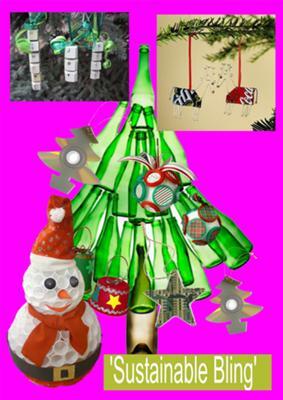 Both trees will be lit up with laser lights to highlight all the lovely 'sustainable bling' that has been created by the community. Swell Sculpture Festival, Queensland’s premier outdoor sculpture exhibition, invites entries from artists to exhibit in the 2011 exhibition. 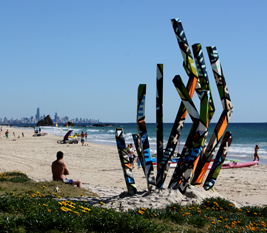 The ninth annual, free outdoor sculpture exhibition will be held along Currumbin Beach from the 9th – 18th September 2011. 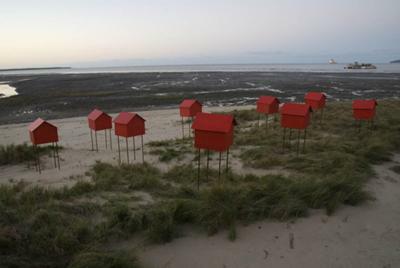 Swell Sculpture Festival provides artists with the opportunity to exhibit in a highly regarded exhibition set within a visually stimulating, expansive coastal landscape. Artists will vie for up to $30,000 in Awards and Acquisitions with the Gold Coast City Council acquiring a sculpture up to $20,000 to be permanently installed in Division 14. Other awards include the highly popular People’s and Kids’ Choice Awards, Emerging Artist Award, Environmental Awareness Award, Media Award and Artist Peer Award. Exhibiting 55 sculptures, Swell Sculpture Festival supports full freedom of expression for all forms of sculpture and encourage submissions. Highlights include the Swell Smalls Gallery - an exhibition of smaller works, artist talks, twilight walks, kids’ workshops, public art forum and master classes. SSF allows the artist full freedom of expression for all forms of sculpture. Sculptors must take into consideration the challenges of building for and installing the sculpture in a natural landscape and consider the safety and regulations of the beach and parklands. We encourage large art forms simply because the beach is a vast open space and lends itself to sculptures that are durable and built for permanent installation. ARTISTS WANTED - APPLICATIONS CLOSE 5pm, 30th of SEPTEMBER 2009 to exhibit in 2010. Applications will be accepted from individual artists, art groups and curators living in North Queensland. Cell Art Space encourages emerging visual artists to apply. Applicants are encouraged to visit Cell Art Space,109 Lake St to see its full potential. Following the very successful “Earth Links” exhibition held in 2008 which featured ceramic works from our Sister Cities, Cairns Regional Council will present an exhibition from 26 September to 15 October 2009 at The Tanks, featuring photographs of the people and lifestyle in the Cairns region and that of our Sister Cities. So that the photographs also provide us with a snapshot of a moment in time, photographers in our Sister Cities and in the Cairns Region are invited to submit photographs taken during a 24 period from 12 noon on Saturday 2 May 2009 to 12 noon on Sunday 3 May 2009. Twenty photographs depicting the people and lifestyle of the Cairns Region and twenty from each of our Sister Cities will be featured in the exhibition. The twenty photographs to feature in the exhibition from the Cairns Region will be chosen by the Cairns Regional Council Sister Cities Management Committee and a representative nominated by the Cairns Photographic Society. All entries must be the original work of the entrant taken during the 24 hours from 12 noon on Saturday 2 May 2009 to 12 noon on Sunday 3 May 2009 in the Cairns region (defined by the Council electoral boundaries). 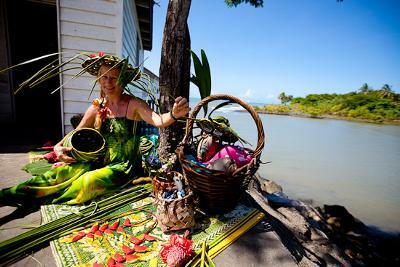 Photographs must comprise the people of the Cairns Region and their lifestyle. All entries must be either in JPEG or TIF format with a minimum of 6 megapixels, submitted on a CD. Photographs can be in colour or black and white. Up to four photographs can be submitted. In Australia there are no specific laws preventing a photographer from taking photographs of people and private property from a vantage point on public property. However, other Australian laws do incidentally restrict the use that can be made of photographs of people and their property. For this reason, it is recommended that all photographers use a written release when photographing individuals or private property in order to prevent any infringement of peoples' rights. A copy of a Model Release Form is available for your use. Note: Photographs taken of children (under the age of 18) must be approved by obtaining a Model Release signed by their parent or guardian. Entrants agree to allow all works to be reproduced without fee for the exhibition and further promotional use, which may include, but are not limited to advertising brochures, advertising posters, free promotional cards, advertising in magazines, newspapers, television and the Cairns Regional Council’s website. Copyright of the images will always remain with the photographer. A signed Entry Form must accompany the photographs. Entries clearly addressed to “Sister Cities Photographic Exhibition”, can be delivered to the Cairns Regional Council offices in Cairns or Mossman, or mailed to PO Box 359, Cairns Qld 4870. Round two 2010/11 of the Regional Arts Development Fund is now open, with applications due in to Cairns Regional Council by Wednesday 30 March 2011. Professional and emerging artists or arts groups are invited to apply under one of the eight categories of funding. More information about the program can be viewed at http://www.arts.qld.gov.au/funding/radf.html. For enquiries or to arrange a meeting, contact the RADF Liaison Officer on 4032 6614 or email a.huelinATcairns.qld.gov.au. The Regional Arts Development Fund is a partnership between Local Government and the State Government through Arts Queensland that supports professional and emerging professional artists living in regional Queensland. This festival will be an exciting three days of cutting-edge multi-arts improvisatory performances, artist talks and workshops, with guests from intra- and interstate, working together with local professional and emerging artists. 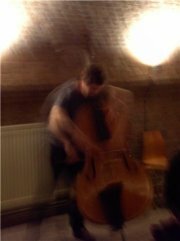 The 2010 Festival will feature special guest artists, Mike Majkowski (Sydney, string bass & improvisation)and Rod Cooper (Melbourne, self-built instruments), and will take place at the School of Creative Arts, JCU. This will be the fourth See Hear Now Festival presented in Townsville by the Music Centre North Qld under Artistic Director, Dr Michael Whiticker. OFFICIAL OPENING - 7.30pm Saturday 10th October 2009. A cordial invitation is extended to all artists, friends and supporters. 10am to 12 noon. Free entry. 12noon. Free entry. A beautiful lunch can be purchased from the Innisfail Art Deco Society. 2pm. Sunday 11th October 2009. Sunday 18th October 2009, from 9am to 12noon. 12noon to 4pm Friday 9th October 2009. Shire Hall Innisfail. - $2000 sponsored by JK Mining. Non-acquisitive. Entry automatic to all exhibiting artists. - $500 sponsored by Paronella Park. - $500 sponsored by Brothers Leagues Club. - $500 sponsored by I.C.Taylor Holden Pty Ltd and Halpin Partners. Non-acquisitive. Medium/s can be charcoal, oil & soft pastels, collage, pen/brush and ink, graphite pencil, chalk, conte crayon, water-soluble pencils etc. - $200 sponsored by Cairns Craft Centre. Non-acquisitive. Maximum artwork size 6“x 8“or 15cm x 20cm (unframed dimensions). - $500 sponsored by Mager Constructions. Non-acquisitive. Suitably fired, hand built or wheel thrown pottery. - $500 sponsored by Rothnie’s Pharmacy. Non-acquisitive. Free standing, any subject. - $500 sponsored by Ergon Energy. Non-acquisitive. Weaving, silk ribbon embroidery etc. - $300 sponsored by Mr Kunobert Schmidt and Cumic Steel. Non-acquisitive. Any subject. 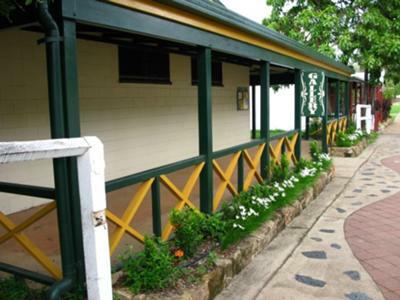 - $200 voucher sponsored by Cairns Craft Centre. Non-acquisitive. Hand made. Artist must have copyright on any text. - $400 sponsored by Mr and Mrs G and H Schmidt. Non-acquisitive. Hands-on/direct ink-plate contact application required. - $600 sponsored by Mr Scott Doherty and the Hensler and Strickland Families. Non-acquisitive. Automatic entry for financial Innisfail Art Society Members. - $400 sponsored by Bundaberg Sugar. Non-acquisitive. Artists must live in the CCRC Shire and up to and including Babinda. - $100 sponsored by Innisfail Chemex. Same as local award. Artist must be 18yrs or younger. - $250 sponsored by Moore Stephens. Non-acquisitive. Automatic entry to all artists. - $250 sponsored by North Coast Machinery. Charity Art Auction at Angsana June 25. The Australian Rainforest Foundation (ARF) is seeking local artists to donate pieces for auction or offer larger pieces for commission based placement. The Auction is supported by Westpac, Tourism Palm Cove and Angsana Palm Cove Resort and Spa. This is a great opportunity to showcase your work to an exclusive audience of art enthusiasts and help the ARF raise vital funds for our environment locally in NQ. Date: 25 June 2010 with pieces on display at Palm Cove from 12 June 2010 at Angsana Resort and Spa foyer. Catalogue to be sent out 31 May 2010. Pieces supplied with photography will help ensure full coverage of the artist's work. We are accepting pieces from a variety of mediums, and look forward to meeting the artists themselves. if it is donated by someone other than the artists - information on the business or person. a photo if at all possible to put in the catalogue. Please go to our website and see how you will be helping protect, extend and recover vital land for endangered species locally. Resale royalty information sessions - register now! Copyright Agency Limited (CAL) will be hosting another series of information sessions on the Australian visual artists' resale royalty scheme during July, August and September - so if you're a visual artist, register now to attend these free events. These information sessions will explain how the scheme works, and how it affects you as an artist. Separate sessions will be held for artists and for 'art market professionals' (art galleries, art centres, dealers, auction houses etc). Sessions for artists will be held as follows. * Numbers in Darwin are restricted to 50. Sessions for art market professionals will be held as follows. CAL has been appointed by the government to administer the scheme, which commenced on 9 June 2010. The scheme entitles visual artists to receive payment of a 5% royalty on certain resales of their works. It also requires art dealers, galleries, auction houses and Indigenous Art Centres to report certain information about their commercial resales. installations, lithographs, multimedia artworks, paintings, photographs, pictures, prints, sculptures, tapestries, video artworks and weavings. When is a royalty payable? 4. the artist or the beneficiary of the artist's estate is Australian. What do I need to do to receive resale royalties? If your works are resold in the future, you will need to be registered with CAL for CAL to pay the royalties to you. Registration costs you nothing, but you must give CAL certain information. Remember that royalties are not payable until the second change of ownership after 8 June 2010. This means that how soon you become entitled to resale royalties will depend on how quickly your work changes hands for the first time, then the second, after 8 June 2010. You can find more information and register to participate in the scheme online at www.resaleroyalty.org.au. About Copyright Agency Limited (CAL) - CAL is a non-profit organisation, established in 1974, that collects and distributes copyright fees for authors, artists, photographers, publishers and others. There is more information about CAL, on its website www.copyright.com.au. If you’re an independent or emerging artist then Cell Art Space wants to hear from you. Cell Art Space is an exciting exhibition space in Cairns accessible 24/7 in a unique inner city location. Every week thousands of regional residents, national and international visitors view the space. If you’re looking for the next step in your arts career then please keep reading. 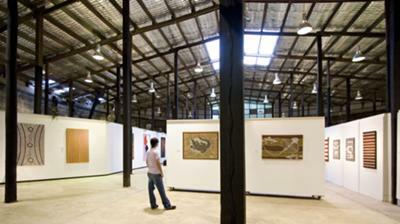 2012 Cell Art Space exhibition applications are open now and close at 5pm on 30 September 2011. Cell Art Space is encouraging EMERGING ARTISTS to apply with an INSTALLATION element in their proposed exhibition. Please return applications to infoATcellartspace.com or Cell Art Space PO Box 5152 CAIRNS QLD 4870. We look forward to reading about your exhibition ideas. 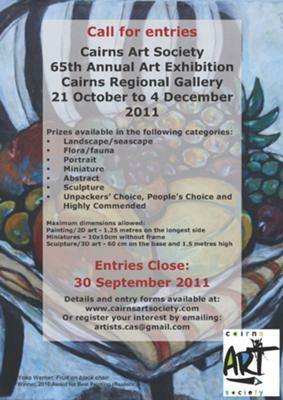 The Cairns Art Society's 65th Annual Art Exhibition will be held at the Cairns Regional Gallery from 21 October to 4 December 2011. Entries Close on 30 September 2011. Digger Street aims to create a sanctuary for artists to immerse themselves in their art. Situated in the tropics where balmy winter days make way for the tempest of the wet, focus is encouraged in the direction of the artist and the land both physically, emotionally and creatively. Digger Street is a self-funding residential space used primarily to house artists and their passion. 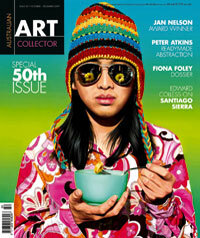 The free monthly Art Prizes Update e-newsletter is perfect for artists. Every month, we'll remind you which prizes are currently calling for entries and notify you of upcoming deadlines. You'll also be the first to know when finalists and winners are announced. The Art Prizes Update e-newsletter covers the full range of opportunities for artists, including scholarships, grants, fellowships and residencies. To subscribe visit www.artcollector.net.au & enter your email address under the "Free Newsletter" section of the page and click submit. 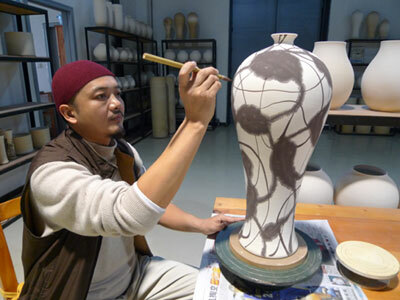 Bai Ming will demonstrate traditional Chinese painting and decoration techniques on porcelain vase adding his own personal contemporary style. Students will be able to practice these techniques upon ceramic tiles using glazes that Bai Ming has brought with him from China. Bai Ming will present a slide show of his own work as well as slide show on Contemporary Chinese Ceramics. Bai Ming will demonstrate his approach to sculpture. As a confirmed teacher, Bai Ming’s workshop will take you through a spiritual process where clay is the expression of an intrinsic language that is the very reflection of the features of the Chinese culture. Bai Ming will also present a slide show of his own work as well as slide show on Contemporary Chinese Ceramics. Born in 1965 in Yugan County, Jiangxi Province, Bai Ming is a renowned ceramic artist, painter, and ceramic art theorist in China. He also teaches as a lecturer at the College of Fine Art of Tsinghua University. Mr. Bai is the member of China Artists Association (CAA), a member of China Oil Painting Society (COPS) and a member of International Academy of Ceramics (IAC) of UNESCO. He is the art director of China Ceramic Art Net www.artcn.net and Executive Chief Editor of China Ceramist . Mr. Bai is also visiting professor of Hubei University of Technology and Guangxi Art Institute. 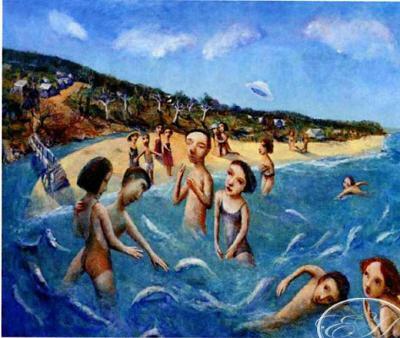 Bai Ming has held six large solo art exhibitions and participated hundred of domestic and international exhibitions and academic invitational exhibitions. His ceramic artworks, paintings, and artistic experiences were introduced in many important domestic and international art books, albums, newspapers, TV programs. He also serves as guest editor, guest editor-in-chief, guest column host and writer for several art, journal and newspaper publishers. BAI MING is the author of the book: "The Porcelaine of Jingdezhen"
Tanks Arts Centre is offering artists´ residencies to visual artists, musicians, writers, new media and performance artists for short and long term projects that have a presentation outcome at Tanks. 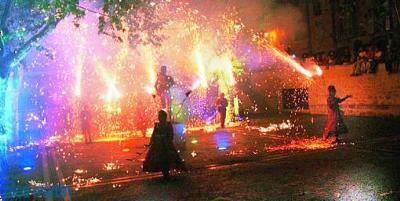 We encourage creative ideas from artists and community groups who wish to work with artists. We can help with project design, budgeting and funding strategies. We are particularly interested in proposals that involve multi artforms and utilise the unique features of Tanks. Local, national and international artists are all welcome to make written application with a brief description and rationale for your residency. Expressions of interest are invited for the part-time positions of Festival Manager, Artistic Director and Events Coordinator, Go Troppo Arts Festival 2011. Highly organised and motivated applicants should be prepared to source funding for their on-going position(s) and for other aspects of events, volunteers and partnerships development as well as for effective marketing to southern and overseas markets. Successful applicants will have had prior experience in similar roles. They will report to the executive management committee on a regular basis and will receive direction from them. Assistance will be given re suggested funding sources and past records will be made available to the successful applicant(s). Jill Booth, President Go Troppo Arts Festival PO Box 925 Port Douglas 4877 or email to jillATgo-troppo-arts-festival.com . Enquiries please phone 4099 3448 or 0439 886 480. Please also pass this on to anyone who you think may be interested in finding out more about these key positions. Cairns Regional Council is seeking applications from interested members of the community to fill a vacancy in the Regional Arts Development Fund (RADF) Committee. The RADF Committee is made up of professionals representing different arts genres who volunteer their time and experience to help administer this important grant program. a.huelinATcairns.qld.gov.au for an application package. Applications close on 25 June 2010. Heyday Festival is a brand spanking new Cairns based multi-arts youth festival designed by, for and with young people. The festival will incorporate creative arts across the board including all the cutting edge and raw talent we can find: music, dance, visual arts, multi-media, performance, fashion, markets, craft gurus, bubble wrap installation makers, comedians, horror shadow puppeteers, whatever our young people can think up, produce and is in our capacity to incorporate! The program will be restricted to 12-30 year old artists so we can take ownership, show off, support each other, prove the strength of our regional youth arts sector and grow it. For the same reasons Heyday Festival will be managed by 18-30 year old energised, passionate and skilled artsworkers that will be mentored by industry professionals. Our mission: to develop Far North Queensland’s youth arts sector by nurturing young artists, artsworkers, entrepreneurs and doers. Why? Artists, actors, musicians, dancers, in short our creative friends and peers often leave for metropolitan areas. Why? There is not enough creative stuff to do. Why? There are very few creative jobs. Why? There are hardly any meaningful professional development opportunities. Why? The list goes on… so let’s change it! We can have a better quality lifestyle and so can our friends; family, networks and our region will rock just a tad bit more from it. Let’s be each other’s think-buddies, try and fail and try and learn and try and succeed and develop and make our unrealistic dreams happen! Melissa Edwards, Founding Director, is bringing together the 2012 Heyday Festival Coordinators. If you are energised, passionate, skilled and want to have a career in the arts in any of the following fields you should apply. Artists from throughout Northern Queensland are invited to participate in the 2nd annual Esplanart exhibition, to be held as part of Cairns Festival from Friday 20 August to Sunday 5 September 2010. This temporary public art event will feature the work of 10 diverse local artists. Esplanart is intended as a site specific exhibition, positioned along the Cairns Esplanade, with sculpture and installations relating directly to the immediate environment. We welcome immediate proposals from both emerging and established artists. Williams Esplanade, Palm Cove. N.QLD. and all sales are commission free! We invite all artists and crafts persons to come along to this fantastic event in beautiful Palm Cove Village. Bring your paints and easels, jewels, pots,candles,weavings, cards and beads, equipment and tools and set up along the foreshore. We have a couple of marquees available for shade to work under (first in gets a place)or you can set up tables and chairs alongside. Professional Artists will hold a couple of workshops for a small attendance fee. We hope to entice Lenore Howard! The resorts and restaurants in the village are offering special discounts for this Queen's Birthday long weekend, so why not take a break and come and stay with us and find inspiration for your masterpiece work. 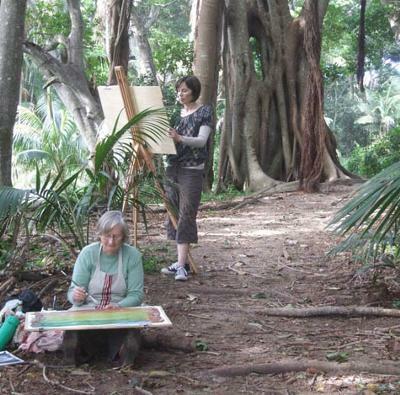 Designed for those who simply love to paint and draw, 4-day Arajilla Artists Retreats on spectacular World Heritage listed Lord Howe Island give you a great excuse to escape. The Visual Arts Association of Far North Queensland is, once again, coordinating the works and entries for the Visual Arts Section of the Show. This project is co-ordinated by Cairns Regional Council’s Creative Partnerships team and funded by the Cairns Regional Council Public Art Fund, Arts Queensland. It's also made possible by the Australian Government’s Regional Arts Fund. The fund gives artists and communities throughout regional, rural, and remote Australia better access to opportunities to practice and experience the arts. Changing Lanes responds to the community’s desire for a more vibrant, cultural, lively and connected city centre. Three lanes have been selected within the Cairns CBD to be used as public art galleries. They are located off Lake, Spence and Grafton Streets. The vision for the project is to deliver a vibrant new dimension to Cairns by encouraging people to explore the city and discover rich, engaging and innovative artworks. By revitalising and reactivating these hidden, under-used city spaces, it is expected to bring economic benefits, including increased local patronage and tourism. Surrounding businesses will also benefit from their unique setting, whilst established and emerging artists will have new venues to showcase their talents. The project will shortlist ten established artists to each create a concept with 5 artworks to be commissioned. A mentoring system will also take place with nine emerging artists to be mentored by Jill Chism, Russell Milledge, and Daniel Wallwork to collaborate on three artworks. All successful artists will attend a development workshop at the Tanks Arts Centre in February with Andrea Kliest (Public Art Project Manger - Melbourne’s Laneway Commissions), Carmel Haugh and Amanda Harris (Urban Art Projects). Suzanne Gibson (Cairns Historical Society) will provide an historical background to the CBD for artists. Artworks will be installed in May 2011 and launched with the Changing Lanes Festival on Saturday May 7th in Bank Lane. Applications close February 1st 2011. Please contact Kain Shepherd on 4032 6628 or Email k.shepherdATcairns.qld.gov.au for more information. This second bi-annual A.I.R. Vallauris benefit will be held in conjunction with the Fête Picasso and includes a competition, exhibition and sale of Small Art Objects. This benefit event takes place bi-annually with the same format but with a different object theme. The Fête Picasso is a popular event that takes place annually in celebration of its most famous artist in residence, who lived and created in Vallauris and the region from 1946 until his death. The presence of Picasso in Vallauris brought with it an unexpected effervescence: the presence of numerous personalities (Cocteau, Prévert), corridas in the streets as well as Picasso's birthday parties that were celebrated by the entire town. The "Picasso Effect" was equally visible in the development of Ceramic Art. Several painters and sculptors (Brauner, Pignon, Ozenfant, Prinner, Chagall, Matisse) followed Picasso into the studios of Vallauris and many ceramists (Portanier, Valentin, Diato, Perot) set up studios in Vallauris, precisely because of this stimulating presence. The jury is comprised of A.I.R. Vallauris alumni resident artists.10 outstanding works will be selected by the jury and each awarded artist will receive a prize of value 250 euros. The exhibition opens on July 18th during the Fête Picasso, and closes August 14th. 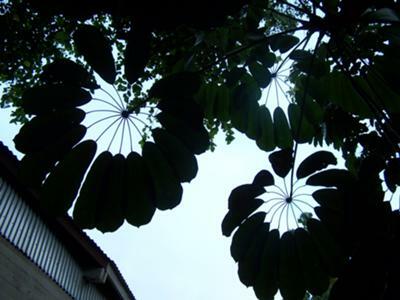 The exhibition will take place in the Gallery Aqui Siam Ben and online from the website www.air-vallauris.org. All Small Art Objects will be sold by way of a silent auction, with proceeds going to A.I.R. Vallauris benefit. While this is a fund-raising activity to help finance the ongoing activities of A.I.R. Vallauris, the event offers participants a valuable opportunity for exposure. All submitted entries will be exhibited in the gallery and online, and a catalogue will be published for the event that will be forwarded to all participants. The competition is open to all artists from all countries. The Small Art Objects can be made from any material, within the restrictions of size. Deadline for registrations and delivery of works is June 20, 2009. The Mareeba Art Society inc. invites and accepts entries for their 49th Annual Exhibition, from all artists. This year the Exhibition offers an open award of $1000.00 open to all entries. Entry forms and conditions are available from their web site at http://artscrafts4880.tripod.com/id15.html The Exhibition opens Monday 11th July 2011 and is open until noon Saturday 16th July 2011. Entries close on Friday 1st July 2011. If you’re a visual artist, actor, musician, writer, heritage worker and you have an idea for an arts project that needs funding to get off the ground – Cairns Regional Council needs you to help us help you! Every year, Council makes a bid to the Queensland Government (through Arts Queensland) to partner with us to support professional and emerging artists through the Regional Arts Development Fund. To help us build a really strong case for funding, we want to present an indication of the kinds of projects that are being planned for the 2011/12 financial year. So, even if your ideas are still germinating, we want to hear about them. Please send us a brief expression of interest telling us about any projects that you may seek RADF funding for in the future. Email a.huelinATcairns.qld.gov.au before 30 March 2011 or call 4032 6614 for more information. Gyeonggi International Ceramix Biennale 2011 International Competition calls for artists from April 1 to May 31, 2011. 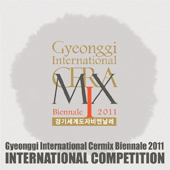 The Korea Ceramic Foundation (KOCEF) would like to announce that the Gyeonggi International Ceramix Biennale 2011, will be held for 30 days from September 24, 2011. The International Competition, one of the main parts of the biennale, has been a dynamic forum where the latest issues facing contemporary ceramics are explored, since 2001. In the previous competition in 2009, we received big attention the world over; 1,726 artists from 70 countries submitted 3,196 artworks. International Competition 2011 - Open to ceramic artists the world over. Works in collaboration with other genres are all welcome but the majority of the works should be ceramic. The winners of the competition will receive the large cash prizes. Only online submissions will be acceptable. (www.kocef.org). Digital images of the work, minimum 1,100 pixels wide in jpeg format are necessary. A single entry should be, when displayed, within these specified dimensions: 250cm (width); 250cm (depth); 250cm (height). 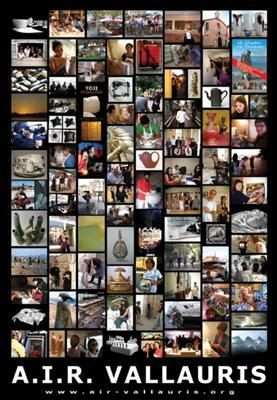 Submission of Actual Works for Final Selection, from July 21 to August 15, 2011. At the final selection, all prizewinners will be determined. All entries that make it to the final round of screening may not be awarded. In this case, these works will be returned by KOCEF. We invite you to let your imagination and creativity run wild! No artistic or organizational ability needed. Emerging artists and volunteers encouraged to attend - empower yourself! Principles and systems discussed can apply to almost any event – eg your school fete, end of year concert as well as arts events. Learn practical skills and help your community as well as yourself. Take away purpose-written materials and strategies for the future. This project has been made possible by an Arts and Cultural grant from Cairns Regional Council - supporting the Arts and local communities. Art Judges are Yvonne Anderson and Agata Sosin-Parkin. I wish I could join you all. Sounds exciting, but I cannot get away from Chicago Illinois (USA). The Department of Communities is rebuilding the Marlin Coast Neighbourhood Centre in Trinity Park, Cairns. Through the art+place policy and the Department of Communities, there is an allocation for public art for the project. 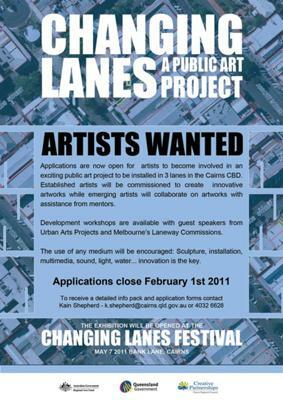 All local Cairns artists are encouraged to apply. Closes COB Friday 10th September. The Public Art Unit, Project Services, is calling for Expressions of Interest from artists on behalf of Department of Communities for the newly rebuilt Charters Towers Neighbourhood Centre. Artists with an interest in Public Art are invited to apply. Submissions must be received by 5pm on Friday 28th May 2010. 6 FREE coffees at Twelve Bar Cafe and much more! Membership is only $38.50 annually. Your rewards make this better than cost-neutral!